A long-lost war memorial has returned to Oldham this month. The roll of honour lists the names of members of the Oldham and District Cop Packers’ Association who died in the first world war. The memorial had previously been in the collections of the Working Class Movement Library who have generously transferred it to Gallery Oldham. The packing of cops containing the spun cotton yarn was one of many specialised jobs in Oldham’s cotton spinning mills. Cop packers were a familiar and essential part of the workforce being responsible for the packing of the cops as well as ensuring the correct moisture content of the yarn before it was sent off be woven. The outbreak of war in 1914 saw many cop packers respond to the call to join the armed forces. The subsequent shortage of labour saw both women and boys find work as packers though the union insisted they were not employed at lower rates of pay than the men who had enlisted and that they would leave the mill once the war was over. Cop packers were well-paid factory workers and by the end of the war there were reports of lads earning weekly wages of over £3. As the 116 names on the wreath-shaped memorial testify not all of the cop packers who joined up were to return home, leaving the union to recognise the sacrifice they had made. This represented a considerable loss, given that the union had some 1200 members at the beginning of the war. Gallery Oldham has an extensive collection of war memorials, many of which are currently on display at the ‘Peace and Plenty’ exhibition which traces the impact of the war on Oldham. But the gallery did not possess a memorial commissioned by any of the local cotton unions. ‘This is an important local war memorial and it is exciting to see it return to the town. We have many local community and institutional memorials but none commissioned by the trade unions which were such a conspicuous feature of Oldham life when it was the largest cotton spinning town in the world’ said Alan Fowler, one of the curators of the current exhibition. The Cop Packers memorial is now on display in the ‘Peace and Plenty? Oldham and the First World War’ exhibition which runs until 12 January 2019. The Oldham and District Cop Packers’ Association was one of the smaller trade unions in the Lancashire cotton industry. In total the union recorded that 1036 of its members served in the armed forces during the conflict, of whom 116 had died. As in other unions, a war memorial was commissioned to recognise the fallen. This took the form of a bronze tablet on which were listed the names of the members killed. The tablet was set in a wooden cabinet, a design selected because it would become a practical part of the union’s office furniture – ‘an instrument of usefulness in the daily life of the association’ – rather than simply being attached to the office wall. 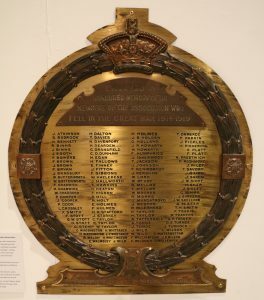 The tablet was made by Baxendale & Co of Manchester who added memorial tablets (in brass, bronze, copper and marble) to their extensive catalogue of metalwork goods after the war. The cabinet was the work of Simpoles, a well-known Manchester firm of furniture makers. The cost was £206-18s-0d. The memorial was unveiled in the union’s offices (85 Union Street) on Saturday 4 June 1921 by James Crinion, leader of the Card Room Amalgamation. In its early years the cop packers had looked to affiliate with the Spinners’ Amalgamation but this was rebuffed and it subsequently developed closer ties with the Cardroom Amalgamation, eventually joining at the end of 1914. The memorial was described ‘a splendid piece of workmanship’ in the local press. Unfortunately, no photograph of the memorial in situ was published in the newspapers or union reports and none have been located in the archives. The subsequent history of the memorial is also unknown though presumably the cabinet was removed when the union changed its address, and may have been removed from the cabinet at around the time the union ceased its activities.